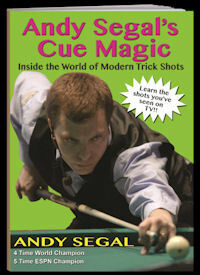 Watch a sample trade show exhibition In the hands of a master entertainer and recognizable TV talent, trick shots can become a powerful sales tool. On the trade show floor, few feature attractions can match the effectiveness or uniqueness of trick shots in attracting and holding a crowd while communicating your marketing messages. Andy Segal has performed at numerous trade shows and events, and is able to incorporate sales materials, your company message, your staff and clients into the performance. Standard entertainment acts are nice, but they are everywhere. 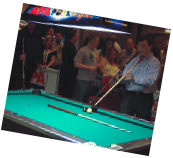 Only a select few can perform on a pool table, and only Andy Segal brings the quality and expertise that you need for a top-notch experience. Trick shots, challenge matches and instruction also make an extremely effective addition to your hospitality suite, providing personalized entertainment to distinguish your suite from the countless other lackluster sales traps.